Evolve 1 is currently available for pre-order. It is scheduled to begin shipping on March 1. The show opened with Davey Richards and Kyle O'Reilly warming up backstage with Tony Kozina. O'Reilly was kicking some pads. Richards noticed the cameras in his locker room and told the woman with the cameraman that he wanted them gone. She explained to him that there were cameras in all of the locker rooms, but Richards said he would remove her himself if he had to. The woman protested until Kozina stepped in and asked her nicely to leave. Kota Ibushi and Sawa were then shown talking in Japanese backstage. -A highlight package aired featuring the wrestlers in Evolve competing in FIP and DGUSA. -Several of the wrestlers were asked why they wrestle. The wrestlers had various answers for the question. Some yelled and screamed. Others were more laid back. -Kyle O'Reilly and Bobby Fish came out to the same music. They were introduced by the ring announced and the action quickly began. Lenny Leonard and Chikarason are doing the commentary at ringside. RADICAN'S ANALYSIS: This was a solid opener. Both men delivered some hard-hitting exchanges that popped the crowd. Neither man showed the appropriate facial expressions when they went to the fighting spirit sequences, but O'Reilly has some potential if he can develop some charisma. -After the match, Lenny Leonard interviewed Taylor. Taylor said he was mad about having to win a qualifying match. Taylor said he was going to win every single match that he was in just to make the Evolve office's lives miserable. RADICAN'S ANALYSIS: Much like the first match, this was short but good. Taylor controlled the early stages of the match until Cheech made a solid comeback. The crowd is doing a good job of creating a loud atmosphere for the undercard matches so far. I liked the execution of the post-match promo as well with Taylor giving his thoughts on his win with Leonard asking the questions. RADICAN'S ANALYSIS: This was a fun match while it lasted, but it was so short they didn't get a chance to tell much of a story. Cannon hit all sorts of big moves on Ricochet, but he kept kicking out. Ricochet seemed to just do a lot of flips around the ring without them really meaning anything. the match was entertaining while it lasted, but not particularly memorable. -Chuck Taylor came out and told Ricochet he didn't believe in Evolution. He said he didn't come here to evolve, but instead he came here to create his own spot. Taylor challenged Ricochet to a match at that next show. Ricochet agreed and challenged him to a match on the spot, but Taylor backed off. -Jimmy Jacobs was backstage with two other wrestlers. One of the wrestlers told Jacobs he had a match coming up shortly. Jacobs seemed upset and walked off with a cigarette in his mouth. Another wrestler was shown backstage writing on his wrist tape. (4) DCFC (Kory Chavis & Jon Davis) vs. Aeroform (Louis Lyndon & Flip Kendrick). Kendrick hit a nice dive to the outside on Davis. Moments later Lyndon nailed Davis with a kick and bounced off the ropes, but Davis obliterated him with a clothesline. DCFC hit the head rush on Kendrick for a nearfall as they took control of the match. Aeroform fired back and Kendrick nailed Chavis with a body press off the top. Kendrick then took down Davis and nailed him with a spinning senton. Lyndon went for a dive, but Davis cut him off with a knee on the apron. Lyndon blocked a brainbuster attempt from Davis on the apron and then flipped off of him and nailed Chavis with a moonsault to the outside. RADICAN'S ANALYSIS: I really enjoyed this match, as the power of DCFC meshed well with the high-flying of Aeroform and made for a fun match. Davis's pounce on Kendrick looked really cool. The crowd was really into DCFC and chanted for them as they made their exit. Lenny Leonard interviewed Martinez after the match. Martinez said Evolve isn't just a promotion for men. She said she was here to show that women belonged here. Martinez said Evolve better bring more to the table for her. RADICAN'S ANALYSIS: This was an impressive squash. Martinez's post-match promo was also strong. She looked really good here. (6) Brad Allen vs. Silas Young. Young slapped Allen across the face right after the bell. Allen fired back and booted Young out of the ring before nailing him with a dive over the top rope. The announcers talked about Allen dedicated his career to his mother, who had passed away. Allen went for a body press off the top, but Young got out of the way. Both men exchanged chops, but Allen took Young down with a big clothesline. Allen nailed Young with several knee strikes to the head, but Young slipped out of the ring and nailed him with a DDT off the apron. Leonard interviewed Allen after the match. The mic broke up a bit and the crowd booed as Allen talked. Allen thanked the fans and Evolve for the opportunity to wrestle. Allen thanked his mom and said that he had just had the toughest match of his life. Allen said he wanted to face the best. He said that he had heard someone had been booked for the second show. 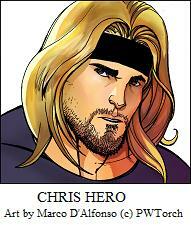 He then challenged Chris Hero to a match at the next Evolve show on March 13. RADICAN'S ANALYSIS: This was a very good singles match. Allen's moonsault to the outside was really scary because he landed badly, but otherwise these two delivered a really intense match that the crowd was into. -Jimmy Jacobs came out to a big ovation. Jacobs got on the mic and said it felt good to be back. He said he would die in the ring for the fans. Jacobs then said Kenn Doane had been given everything in this business. He said he was going to make Doane with he was playing dress up in a cheerleading outfit. 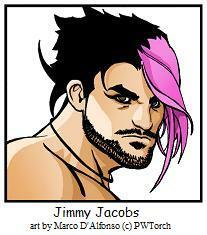 (7) Jimmy Jacobs vs. Kenn Doane. Doane used his power to overwhelm Jacobs, but Jacobs fired back and stomped on Doane in the corner. Jacobs then got a small package on Doane for a nearfall. Jacobs went for the end time, but Doane dumped him onto the apron. Doane missed a charge at Jacobs. Jacobs went for a dive to the outside, but Doane used the ring apron to block him. Doane then took Jacobs down to the mat and worked a chinlock as the crowd rallied behind Jacobs. Doane took down Jacobs with a series of clotheslines a short time later and locked in a chinlock once again. Jacobs got to his feet and drove Doane into the corner, but Doane took him down with a chinlock once again and smiled as the announcers said fans might not like his style, but it's effective. Jacobs tried to fire back once again, but Doane caught him in another chinlock and cranked on Jacobs's neck on the mat. A sarcastic "this is awesome" chant started up as Doane secured another chinlock. Jacobs fired back once again, but Doane caught him with a clothesline. Jacobs fired up and got to his feet. Doane slammed him, but Jacobs got right up. Jacobs nailed Doane with a headscissors. Jacobs went for the end time again, but Doane countered it into a spinebuster for a 2 count. Jacobs ducked a charge from Doane in the corner. Doane got hung up in the corner and Jacobs nailed him with a running chop and then a DDT off the second turnbuckle for a 2 count. Doane blocked the contra code and hit a German suplex with a bridge for a 2 count. Doane went up top, but Jacobs cut him off. Doane sent Jacobs down to the mat and nailed him with a big leg drop off the top for the apparent win, as the ref didn't see that Jacobs's foot was on the ropes. Doane yelled at Dreamer after the match was over before walking off. Dreamer grabbed a mic and got into the ring. The crowd stood on their feet and applauded Dreamer. Dreamer got on the mic and said he had walked away from something that he loved. He said he would never walk away from a wrestling ring because he loved it. Dreamer said he was here to support the men and women in the back. Dreamer thanked the fans and went to leave, but Jacobs grabbed the mic. Jacobs asked Dreamer to get back into the ring as the crowd continued to chant for Dreamer. Jacobs thanked Dreamer for advertising Evolve on his twitter account. Jacobs said he could thank Dreamer for winning his first Evolve match, but he wasn't going to. Jacobs said he didn't need help from someone like Dreamer. Jacobs said Dreamer ignored his calls when he was in WWE. Jacobs said in Evolve he was going to stand alone. Jacobs asked Dreamer if he had come to Evolve to get another moment in the spotlight. He asked Dreamer if crying on national television wasn't enough for him. Jacobs told Dreamer he had suffered enough from watching him wrestle for 15 years. Jacobs said he wouldn't gouge Dreamer's eyes out because Evolve wasn't the place for that. Jacobs said he didn't need a stamp of approval like a wrestler in Orlando getting put over by Hulk Hogan. Dreamer got on the mic and said he came to Evolve for free because his friend was trying to start something. Dreamer said he wasn't on the official roster and was only here to have some fun before attacking Jacobs. Jacobs hit a low blow on dreamer and went on the attack, but Dreamer fired back and nailed him with a DDT. RADICAN'S ANALYSIS: The Doane-Jacobs match told a good story with Doane using his size advantage on Jacobs throughout the match. Dreamer's involvement in the finish of the match and the post-match angle between him and Jacobs made this a memorable segment. Jacobs's mic work on Dreamer was fantastic with references to Dreamer crying on national television when he left ECW recently and there was also a nice reference to Hulk Hogan putting over young talent down in Orlando. 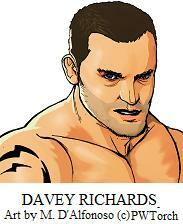 -Davey Richards was shown getting ready for his match backstage. Richards was kicking some pads. Ibushi was shown backstage again getting ready for his match. The woman with the camera screamed at the cameras to follow Doane. Doane stormed out of a bathroom and said he gets screwed everywhere he goes. (8) Chris Dickinson vs. Johnny Gargano. Dickinson nailed Gargano with a series of kicks and then a nice roundhouse kick. He went to charge Gargano, who surprised him with a spear. Gargano countered a rollup attempt into an ace crusher and got several nearfalls with various pinning combinations on the mat. Gargano then slowed down the pace with an abdominal stretch on the mat. Dickinson dead-lifted Gargano to break the hold and nailed him with a gut buster. Gargano spit in Dickinson's face. Dickinson took exception to this and nailed Gargano with the kick to the head and Gargano went flying to the mat. Gargano went into the crowd and hugged Sean Davis, who was with another man. Davis told him they were going to party tonight. RADICAN'S ANALYSIS: This was a really good back and forth battle. Gargano and Dickinson showed a lot of intensity during their battle, but like some of the other matches on the card, this was a rather short match. I still really enjoyed what I saw, especially Dickinson who showcased some really nice kicks and high-flying ability during the course of the match. (9) TJP vs. Munenori Sawa. Both men exchanged slaps to the face before Leonard could introduce them. TJP threw his shirt at Sawa after being introduced and it was on! Both men rolled around the mat and TJP ended up under the ropes. Sawa kicked him and the announcers said both men needed to watch their actions given the rules in Evolve. The action picked up as both men ducked kick attempts and ended up at a stalemate. Sawa went for several submissions on the mat, but TJP was able to fend him off. Sawa finally managed to nail TJP with a kick in the corner, but TJP fired back with a slap. Both men began exchanging kicks and punches. Sawa ended up countering a kick attempt from TJP with a dragon screw. Sawa countered a kick attempt from TJP into a nasty standing submission, but TJP got the ropes. Sawa took him right back down to the mat and worked a leg submission. Sawa laid into TJP's leg with several kicks before dropping an elbow. TJP fired back a short time later and locked in a cross arm breaker, but Sawa got the ropes. TJP kicked Sawa several times. Sawa fired back with a slap, but TJP sent him to the mat with a kick. TJP followed up with a leg submission, which he turned into an arm submission as well, but Sawa countered it into a pinning attempt for a 2 count. Sawa went for a punch, but TJP kicked him in the face. Sawa went for another baseball punch, but TJP kicked him. Both men then kicked each other at the same time and the crowd erupted. RADICAN'S ANALYSIS: This was the best match on the card so far. Both men were so intense from bell to bell and they had the crowd with them from start to finish. Both men bordered on breaking Evolve's code of conduct during the course of the match and that added a lot of intrigue to see what might happen to either man as a result. The crowd gave both men a standing ovation after the match was over. -Adam Cole was shown backstage asking Tommy Dreamer for advice. He narrated the footage of him and Dreamer talking. Cole was then shown seated. He said fans will remember his name. (10) Akuma's Army (Gran Akuma & Icarus & Brodie Lee) vs. Team Frightening (Hallowicked & Frightmare & Mike Quackenbush). Quackenbush ran wild early on Icarus and Akuma before tagging in Hallowicked. Lee tagged in and traded shoulder tackles with Hallowicked. Hallowicked finally took Lee down and nailed him with a running kick in the corner. Frightmare and Akuma ran into the ring and went at it. Akuma rolled under the ropes and Icarus ran in and took out Frightmare with a spear. Since this match is contested under Chikara rules, rolling out of the ring counts as a tag. Frightmare charged at Akuma, who tossed him to Lee. Lee then powerbombed Frightmare to the mat for a 2 count. Akuma's Army continued to isolate Frightmare in their own corner. Akuma lit up Frightmare with a kick before tagging in Lee, who continued the beating. Frightmare tried to fire back, but Lee punched him to the outside, which initiated a tag. Hallowicked ran into the ring, but Lee caught him with an ace crusher for a 2 count. The fans booed as Icarus went to work Frightmare. Frightmare sent Icarus to the outside. 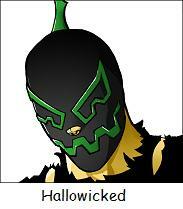 Akuma ran in, but Hallowicked kicked him into Lee. Frightmare nailed Lee with a headscissors takedown. He then countered Akuma with a hurricanrana. Quackenbush tagged into the match and the action broke down. Akuma caught Frightmare with the double knees to the chest for a nearfall. Akuma set up Frightmare and went up top, but Hallowicked cut him off. Akuma pushed Hallowicked to the outside, but he landed right on Lee. Quackenbush sent Akuma to the matt and nailed him with a swanton. Frightmare then nailed Akuma with the double knees, but Icarus broke up the pin. Leonard interviewed Quackenbush after the match. He asked Quackenbush how he felt coming back after back surgery. Quackenbush said he's not all the way back yet. He said multi-man tag matches are his science. Quackenbush made an open challenge for a Four Corner Elimination tag at the next Evolve event. RADICAN'S ANALYSIS: This was a fun tag match. The heels got the heat on Frightmare before the action broke down. There were a lot of solid multi-man spots. The finishing sequence was fun as well with a lot of dives all over the place before Hallowicked nailed Icarus with a lightening bomb for the pin. Quackenbush's promo after the match was also good and set up a match at the next DVD taping. -TJP was shown backstage with documentary girl. She seemed to be tending to him until she noticed the cameras were on them. She yelled at the crew to find Silas. -Richards and Ibushi were both shown getting ready backstage before they came to the ring. Both men came out to a heavy metal mix. Richards got a big ovation and streamers. (11) Kota Ibushi vs. Davey Richards (w/Kyle O'Reilly, Tony Kozina). Both men went at each other right away. Richards took time to pose for the crowd and Ibushi nailed him with a springboard kick. Richards spilled to the outside and Ibushi followed up with a springboard press to the floor. The crowd was red hot for the action as both men went at it on the apron. They exchanged kicks before Richards drove Ibushi shoulder-first into the apron. Richards went to work on Ibushi's arm and locked in a hammerlock submission with a bridge. The announcers said Richards's corner was telling him that Ibushi can't take his kicks. Richards continued to work over Ibushi's shoulder and eventually ended up cinching in an arm and leg submission, but Ibushi managed to break free. The crowd tried to rally Ibushi as Richards wiped blood from his mouth. Richards went up top, but Ibushi cut him off. Both men battle for position, but Richards nailed Ibushi with a divorce court off the top and locked in an arm bar. Ibushi struggled, but managed to get the ropes. Richards taunted Ibushi and told him to hit him. Richards screamed at Ibushi to hit him harder. Ibushi nailed Richards with several strikes before Richards kicked Ibushi across the ring and into the turnbuckles. Richards continued to work over Ibushi's arm, but he wouldn't submit. Ibushi slapped Richards across the face from his knee, but Richards nailed him with a kick to the head and Ibushi looked to be out. Richards went up top again, but Ibushi nailed him with a moonsault kick. That was insane! Both men battled for position to set up a superplex to the floor. Ibushi ended up sending Richards to the floor. He then got a running start on the apron, flipped over the top turnbuckle, and nailed Richards with a moonsault to the outside and the crowd exploded. Ibushi tossed Richards into the ring and nailed him with several kicks, but Richards kicked out at 1. Ibushi nailed Richards with another flurry of kicks, but Richards kicked out once again. Both men began exchanging forearms, but Richards managed to catch Ibushi with a kick to the stomach after dragging him down from the top rope. Richards held his ribs and the announcers said he might have a cracked rib. Richards fired up and nailed Ibushi with several kicks. Richards then hit a handspring kick to Ibushi's head for a 2 count. The crowd went nuts as Richards looked out at them with a sadistic look on his face. Both men exchanged several counters, but Richards managed to catch Ibushi with a cross arm breaker. Ibushi was right near the ropes and was able to break the hold quickly. Richards set up Ibushi on the top rope and nailed him with several hard chops. Richards then nailed Ibushi with a superplex, but Ibushi got right up. Both men exchanged running boots. Ibushi nailed Richards with a running boot and a German with a bridge and the crowd exploded once again. This is insane! Ibushi went up top and nailed Richards with the double moonsault for a nearfall. You know a match is good when it makes the announcers squeal in excitement after a big spot. Ibushi set up Richards on the mat and went up top, but Richards cut him off. Ibushi kicked Richards off of him several times, but Davey eventually nailed Ibushi with release German. Richards hit a backdrop driver, but Ibushi kicked out. Richards followed up with the KO kick, but Ibushi kicked out. Richards got the kimura, but Ibushi rolled him up for a 2 count. Ibushi nailed Richards with a reverse frankensteiner, but Richards got up and nailed him with a big clothesline and both men were down on the mat. The crowd exploded and everyone got on their feet and clapped. Both men bowed to each other after the match and shook hands as the crowd applauded. RADICAN'S ANALYSIS: This was an incredible match with fantastic crowd heat. Richards was fantastic heel, as he worked over Ibushi's arm with kicks and submissions during the early stages of the match. They went a little overboard with the nearfalls at the end, but for a main event on a debut show, it doesn't get much better than this. Richards and Ibushi produced the first MOTY contender for 2010 with this effort. -Brad Allen cut a promo backstage. He said his mother was killed in a car accident right after he signed his first WWE contract. He said his head wasn't where it needed to be. Allen said tonight, everything came together. -Jimmy Jacobs, Johnny Gargano, and Silas Young were shown leaving the venue with Sean Davis. Silas Young was also there, but he said he didn't want to go. Young eventually agreed to go, but his cell phone rang at it showed his wife on caller ID. Overall thoughts: (8.0) The biggest compliment I can give this show is that there was never a dull moment for me while watching it. The show moved at a brisk pace. Evolve is something that offers a very different product from other independent promotions, which I believe will help them grow in the future. The undercard matches moved along at a brisk pace, but I loved how intense all of the competitors were. They entered the ring quickly to the same music, had their names announced, and went right into the match. I felt like I was watching a real sporting event at times, but it didn't feel forced. I enjoyed almost all of the matches on the undercard. I hadn't seen a lot of the wrestlers on the card before, but I came away impressed by the performances of Kyle O'Reilly, Brad Allen, Silas Young, and Chris Dickinson. The Young-Allen match was really intense and I enjoyed it from bell to bell outside of Allen landing on his face after a moonsault attempt to the outside. The top of the card featured two really good singles matches. The Sawa-TJP match was a blast to watch. I felt like I was watching something that was real with two competitors determined to get the better of the other. The Richards-Ibushi match was simply an awesome showcase of strong-style wrestling. Both guys went at it from bell to bell and the crowd ate up the in-ring action. Richards-Ibushi is an early MOTYC. I highly recommend a purchase of Evolve 1. There's never a boring moment on the show and the backstage segments really added a new dimension to some of the new faces on independent scene. I have a feeling that a lot of these wrestlers are going to make of the next generation of independent stars.